Need to retake? Check out our 3-month LSAT Study Schedule & make sure you’re using the best LSAT prep books to study! Having to retake is straight up painful, there is no question about it. You just waited three excruciating weeks for your score, nearly fainted when the score hit your inbox, and then went through the five stages of grief dealing with the fact that your current LSAT score just isn’t enough to get you in to your dream school. So what do you do from here? Before you curse the stars and sign up for another dose of LSAT suffering, make sure you read up on making the decision to retake: https://lawschooli.com/should-i-retake-the-lsat/ The plain reality is that most people don’t do significantly better on a retake. LSAC publishes repeater data can give you an idea of your chances. That said, that data includes all retakers. The majority of people still under-prepare for this test, EVEN ON A REPEAT. Yes, it’s mind blowing I know, but that’s what happens. If you work really hard you have fairly good odds of seeing big improvement on an LSAT retake. For the sub-class of people who did way worse than their practice average, you should be happy (well, reasonably happy). Your poor score this time around was likely an aberration. This test is designed so that your performance should be pretty consistent. It’s way likelier than not that you will hit close to your practice average next time around. So someone who averages 172 on practice tests but hit a 165 on test day is not very likely to have the same problem again. The caveat: make sure you are simulating practice tests as close to test day conditions as possible. Otherwise, you practice average may not be giving an accurate picture of where you’ll land. Retakers can now join a small motivated group of peers that we mentor via private forums, live office hours, premium courses, and access to Josh and I as your guide and coach, all in the LSAT Mastermind Group. Analyze what might have gone wrong on test day to bring your score down. Sometimes the answer is readily apparent: for example, if you were sick on the day of the LSAT that likely hurt your score. Another huge problem for a lot of people is stress. On the first go, test day anxiety just gets the better of people. A common effect is under-performance on the first couple of sections. Also, it’s common to bomb a section entirely after running into a really hard part or to do badly on a following section because you were still stressing over the previous one. These are all pitfalls that can be avoided next time around. See this post on the day of the LSAT, which covers handling bumps in the road. Take comfort in the fact that the test just won’t feel as stressful the second time around. All my tutoring students felt that way. It’s just easier to handle a situation you have been in before. Tough love time: I really don’t care what you do with the rest of your life. You can be lazy and drink all the time and eat terrible food. LSAT time is different. If you really want to do the best on this test, you HAVE to get serious about treating yourself well so that your brain is working at full speed. Studies have shown that intense prep for the LSAT actually alters your brains in positive ways. Don’t interfere with this process by drinking alcohol or letting yourself atrophy on the couch when you aren’t studying. Exercise improves brain functioning, so take advantage of it by doing yoga, running, or whatever else you can tolerate. Even if you never exert yourself physically again, do yourself the biggest favor that you can and exercise while you are studying for the LSAT. Once you are done looking for anything glaringly obvious that went wrong the first time around. 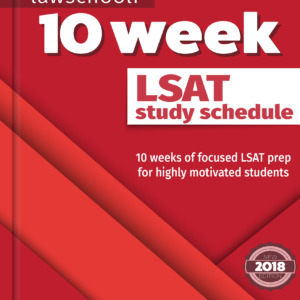 I think that it is important to view a retake as a totally fresh start and focus on how to do the best job prepping this time.If you just took the LSAT and are retaking right away, your main obstacle may be a lack of fresh LSAT questions: doing questions that you have done before is going to be less useful than doing fresh questions. Even though it’s surprising, your brain is pretty good at remembering each and every little problem that you have done. When you redo a problem part your brain is going to be trying to simply remember the answer rather than figure it out properly the way you would have to the first time.This is a big problem so what should you do about it? Look over this list of all of the actual official preptests and carefully identify any that you have not done. You will need to schedule out the remaining fresh tests that you have carefully to make sure that you don’t run out before the actual test. Note that if you followed my advice the first time you took the LSAT you probably have hardly any of these tests left to do. This is no reason to panic. Logic games especially are still very useful even if you have gone through them once before. If you have a very limited amount of fresh stuff left to do, my advice is to save it for the month before you actually retake the LSAT. That way you are prepping intensely with fresh questions at the time when you need to hit max performance. Note that if you put off retaking a year, you’ll probably be fine using old question again. Unless you have an eidetic memory, you’ll probably have forgotten most of them. My first recommendation to anyone doing a retake is to make sure they have the right material to prep with. This means getting any actual, official tests they have not done and also getting the best prep books available on the market. Lawschooli.com is fully independent and we recommend whatever we choose to, and so I feel it’s my duty to steer you away from some of the garbage prep books out there. Princeton Review, McGraw Hill and Kaplan are just plain not good LSAT companies. Most people in the LSAT prep world view them (correctly) as bottom feeders making a living off their reputation in another area, the SATs. It is especially essential if you learned how to diagram logic games problems from any of these books that you now unlearn it and get a system that works for your second try. When I started out I was diagramming games the way Kaplan taught me for a few weeks before I cracked the Powerscore Logic Games Bible. It was immediately apparent to me that they had a better system for attacking games and, trust me, you will feel the same way. Their Logical Reasoning Bible is similarly respected as a means of learning the right strategies for LR questions. Princeton Review’s Cracking the LSAT is not a great book and does not even contain real LSAT questions in its examples. However, I have heard some people say that doing the strange questions can help simulate ‘weirdness’ that people often experience when taking the experimental section. This way, so the advice goes, you are used it so that it doesn’t feel as weird. The idea here is that if you are unprepared the experimental section can throw you off and then affect your later performance. As retakers may be ready to try anything, doing the problems in this book might be worth a stab if you felt that the experimental section messed with your head your first time around. The only exception to the general rule of avoiding Kaplan is their LSAT 180 book. It contains fake LSAT questions designed especially to be really, really hard. It may have some potential payoff for the same reason as “Cracking the LSAT” and also, it’s good practice if you are running out of other problems to do. I found it pretty fun during my study and I think it might be good to do with about a month left to go before your test. …It’s time to go back to assessing what you as an individual need to put in as far as prep time before your retake. 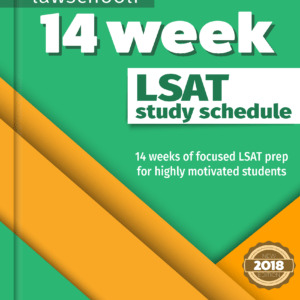 If you only put in a month of study leading up to the first LSAT, then you probably want to just forget everything you did and follow the recommended three month study schedule, adjusted to remove any material you all ready covered. If you didn’t put in enough study the first time, then really search for some motivation and get psyched up to do it right this time. I would assume you knew that the LSAT was serious business the first time around but just couldn’t fit in the time. If you think this might happen again because of pressures from work or home life, then it’s best to put off retaking the LSAT until you are sure you can put in the necessary effort. If on the other hand you did a full, rigorous 3 month prep already, what you are going to do depends a lot on whether your practice tests were strong leading up to the last time. I had one tutoring student who was hitting high 170’s every time on PTs leading up to her first try on the LSAT. Even though she wasn’t ill or anything, she turned in a really poor performance (for her) on test day. This was largely a matter of nerves, so I thought that there wasn’t much additional study she needed to do before her retake. I recommended that she not worry about her poor performance to the extent possible. I told her what I truly believed, which is that it was anomaly and that it’s not likely to happen again. As far as prep, I told her simply to make sure she had built up her test taking stamina again come test day. This meant that she had to be doing a lot of full length tests, at least a few a week in the month leading up to the LSAT. I also encouraged her to train herself for poor conditions. You can do this too: take some LSATs tired, do some in a noisy location, do some when you haven’t had any water for hours. Doing this can help prepare you for bumps in the road. Also, because it was around 3 months to the next LSAT, I recommended that she do at least a couple days of light study a week until that last month, just to maintain the skills. All in all this did not add up to a whole lot more work, because she had already put the work in correctly the first time. She turned in a solid 176 on her retake, so if you are worried nerves are going to beat you, don’t. Doing the test a second time is going to be less stressful. Odds are that you will be able to hit very close to your practice test average. What If I Hit My Practice Average But I Still Wish To Retake? If you put in 3 months of rigorous study and hit around your practice average but still consider your score too low, then the first thing you need to do is reconsider yet again whether you should retake. Frankly, the odds of seeing significant improvement are not in your favor. 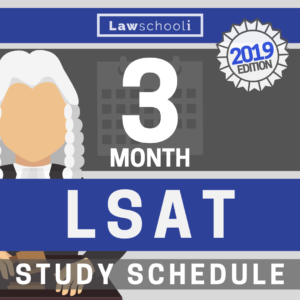 One possible course of action is to sign up for the LSAT and keep studying, but with the idea that you won’t take the LSAT if you don’t see improvements in your practice test scores. A lot of people feel pot-committed once they start studying, but canceling is no big deal and one cancellation does not reflect poorly on your application should you choose to stick with your current score. Dealing With External Pressure: It’s my duty to mention that now would be a fine time to consider whether you want to do law school at all, or perhaps put it off until the future. If your current LSAT score is not good enough to get you into the schools you want to go to at the right price point, not going may well be a better option than adjusting your goals downward to attend another school or attend at a higher cost. A lot of people when they start studying the LSAT get ‘law-school tunnel vision’ where they start to look at law school as their only option. Often, pressure from family plays a role this. Also, people often worry that friends will think they have somehow failed if they start studying for the LSAT and don’t follow through with it or don’t go to law school. To the extent possible try not to let factors like these influence your decision to go to law school. Particularly with the current weak market for legal employment, deciding to take on debt and go to law school is a huge decision. Evaluate this decision as dispassionately as possible and seek lots of advice, especially from recent law graduates who are facing the market. Once you have made the decision that you wish to retake, it’s time to really bend your brain and figure out what can be done to get those practice scores up. Remember, on the LSAT your practice scores are a great indicator of what you are likely to get on test day. Getting a much better score than your practice scores on test day is very rare. The first things I advocate are those already mentioned, which is focusing on your health and making sure you study with the right LSAT prep books. Consider this LSAT a fresh start. You have plenty of time to study and learn a new system of attacking the problems. The other thing to do is make sure that you are getting the extra benefits of intense prep. I say this often because I truly felt it worked for me: say you are practicing logic games on a given day, then practice them so much that when you go to sleep that night you are seeing variables flying around in your head. This is how you really know that you hit that section hard enough that day. You probably want to study this hard at least a couple times a week. Is it exhausting to do this? Yes, but you have to do some things different this time around if you really want to see improvements. This means adding days where you do LSAT questions five or more hours. Listen to people who train any skill- guitar playing, golf, etc., and you will see this is a common theme: the best way to get better with any skill is to do it a lot at one time. The benefits of this intense study is greater than the cumulative benefits of a lot of days of half-hearted study. Once you know this, it’s time to go out there and execute. Again, seek out every single prep question you have not done and make sure it is done before you take the test again. If your logic games score needs improvements, redo nearly every game as they are still very helpful on your second time around. Develop a rigorous schedule and stick with it. Refer back to our recommended schedule to give you an idea of what we consider sufficient. Remember that no matter what your circumstances, you have to make sure you have built up proper test taking endurance again before the test arrives. This means taking lots of full, timed LSAT tests in the weeks leading up to you LSAT retake. As usual, we are here as a free resource if you have questions about what to do in your specific situation. The best way to ask us questions is in the comments on our new lawschooli.com google+ page. Next Article Do Law Schools Read the LSAT Writing Sample? I studied for 6 months and was testing in the 167-169 range. Scored in the high 150’s which completely shattered me. Do you think my score will be higher in December? I bombed the LR sections in September 2014 but I barely slept the two nights before. Not sure how much that impacted me. Thanks. I am retaking the LSAT and currently in the 3rd week of your 12 week study plan. The logic games have me completely confused; this is the section I did most poorly in last time. I do not want to get behind on the schedule, but I’m worried the going ahead in the logic games will be ineffective if I haven’t mastered the basics. Do you have any suggestions? Good night. I’m a foreign student. I took the lsat in June. 152 score. I completely messed up the games but did ok on the other sections. My GPA is 3.6 and I have about 5 years working experience in government for my country in legal based projects, legislative monitoring, law revision and political speech writing. I plan to apply for law school for September 2015. Do you advise retaking the test in trying to secure a scholarship or to apply as is. I studied for about 2 months. Hey! Love your blog  ! I was just wondering, I was waitlisted, then now accepted, but in the interim I signed up to take the June lsat before finding out I was admitted. Is it pointless to take the lsat now to try and boost scholarship money – or is the scholarship money now set in stone and taking the lsat wont help anything? Hi Chelsea, Sorry that I missed this comment. Hope my answer is timely enough to help. Your scholarship money is definitely not set in stone. A June retake where you improve can and does reopen negotiations. Hey Evan. After going through a brutal logic games section yesterday I’m not sure how it went. Hopefully the curve is forgiving and things work out. Again, I appreciate all the advice. Yeah, you aren’t alone in thinking that one was super tough. I hardly saw anybody who thought that game section went smoothly. Iv been studying for about 6 months. I was scoring between 165 to 170. I took the December 2013 LSAT and made a bunch of negligent mistakes (May have been my nerves) but ended up with a150 (lowest score Iv ever gotten). I’m pretty much out of prep tests. How much studying do you recommend I do from now till the Feb LSAT. Sorry I missed this comment. Hopefully you ironed things out. Let me know how it went yesterday if you retook. 152 in June13. 162 in Oct13. You are going to have to do some self-assessment. Did you feel you were at the end of what you could do? If you really put your all into it to get that 162 it may be hard to improve. If you give me some more details, I can try to give you more specific advice. Again, great work getting that large jump.